Star Trek: Log Five (1975) includes three TV-script-to-novella adaptations by Alan Dean Foster based on episodes of Star Trek: The Animated Series: “The Ambergris Element,” “Pirates of Orion,” and “Jihad.” Here, Kirk and Spock get turned into fish people, Spock contracts a terminal illness, and an inter-species task force seeks to prevent a war. Filling this many pages with stories from half-hour teleplays has been a challenge throughout this series, but here, Foster does a quality job of expanding and adding to these episodes in interesting ways. Foster opens, for example, with ten pages of backstory on M’ress; while this doesn’t make for the most fluid narrative (she doesn’t feature in any of the stories), it’s interesting enough. And Foster’s detailed descriptions give these exotic settings far more depth than the Filmation cartoon ever could. The stories themselves aren’t phenomenal – “The Ambergris Element” is meandering, yet fairly predictable, and the reveal at the end of “Jihad” is underdeveloped, but Foster really gets the most out of his material here, and the pacing never gets too bad. We also get the usual silliness and un-Trek-isms from Foster. We’ve got Scotty calling McCoy “Bones,” Spock using contractions and, more egregiously, such imprecisions as “a minute or so,” Kirk’s got a trash can built into his chair, and the Enterprise doesn’t seem to have a second science officer or navigator on board. 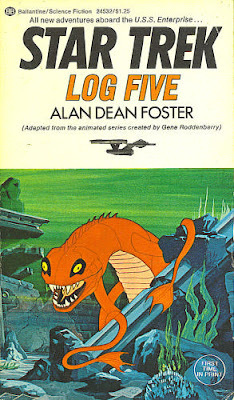 In short, it’s nothing wonderful, but Star Trek: Log Five is certainly one of the more readable books in the Log series.